Native American Indians were a deeply spiritual people and they communicated their history, thoughts, ideas and dreams from generation to generation through Symbols and Signs such as the Owl symbol. Native American bird and animal symbols and totems are believed to represent the physical form of a spirit helper and guide. The meaning of the Owl symbol signifies a bad omen. 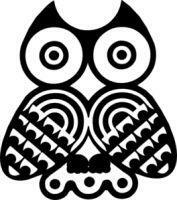 According to Native American legends and myths of some tribes the Owl is a symbol of death. The owl is a creature of the night and was strongly associated with the supernatural. The circles around the eyes of an owl are believed to be made up of the fingernails of ghosts. Owls were also believed to be messengers from beyond the grave and would deliver warnings to people who had broken tribal taboos. Even to hear an owl hooting was considered to be an unlucky omen. The Pueblo people, including the Hopi tribe, associated owls with their belief in witches and the feathers of owls have a very sinister significance. For additional information refer to Power Animals. Choctaw Owl Myth: The Choctaw deity 'Ishkitini', or the horned owl, was believed to prowl about at night killing men and animals. When ishkitini screeched, it meant sudden death, such as a murder. If the 'ofunlo', meaning screech owl, was heard, it was a sign that a child in that family was going to die. If the 'opa', meaning a common owl, was seen perched ontrees near the home and hooted, it was a foreboding of death among near relatives.